During its time of existence Stoudt’s Ferry Bridge had the distinction of being the longest single span, wooden, covered bridge in the world. Stoudt’s Ferry Bridge measured 225 feet between abutments or 240 feet portal to portal. It also had the distinction of being built by the Schuylkill Navigation Company mainly for the purpose of carrying the towpaths of the Schuylkill Canal across the Schuylkill River. This was the only major covered bridge in the United States built for this purpose. The terrain changed at this point and the towpaths had to change from one side of the river to the other. In order to do this, a bridge had to be built and cloverleafs had to be designed to connect the towpaths to the bridge. The over- hanging roof over the towpaths of the bridge had to be free from supports to prevent the towlines from being disconnected every time the mules went over the bridge. The whole design was very carefully thought out. If Stoudt’s Ferry Bridge would still be in existence today, it would be one of Pennsylvania’s major tourist attractions and most likely a national landmark. However, as they say, it was not in the cards. An act was passed in 1850 to incorporate Stout’s (correct spelling at that time according to old newspapers) Ferry Bridge Company for the purpose of building a bridge at the site of Stout’s Ferry over the Schuy1ki11 River near Tuckerton. However, probably due to the lack of funding, the bridge was not built for another seven years. On Monday August 4, 1856 the Stout’s Ferry Bridge Company met in Leinbach’s Tavern to give out the building of their bridge by contract. Construction was begun 6.5 miles north of Reading in 1856 by Batcheler, Bowen, and Wolverton and was completed by 1857. According to the original specifications laid out by the Bridge Company, the following information is known. The main span was to be 25 feet above normal water level. The total width of the bridge was to be 34 feet. The center roadway was to have a width of 14 feet while the two mule walkways on either side were to be 8 feet 6 inches each. A short 40-foot span was to be built adjacent to the main bridge to afford an additional waterway in freshets. Wedges of oak were driven between the abutting ends of the lower chords to fill up where they parted. Diagonal skew back braces had been used on both sides of the bridge. Tie beams under the lower chords were suspended with bolts to the chords. The lower horizontal braces were shouldered and strongly wedged. The suspended portion of the towpaths across the intersection of the arches (defective in not having enough supporting beams) was being corrected. Cables were to be connected at the bridge ends to bring the bridge back into alignment. The camber had dropped to 15 inches, and will remain there due to lack of ability to restore it. Mr. Smith also found other work that had to be corrected because of the short cuts taken by the carpenters. The bridge did not meet the specifications set forth in the original contract. “The arch timbers should have run across three posts and should have required only four screw bolts through every fourth post and two in every two intermediate post. Instead they were cut short and now require four bolts in every post to secure the arch pieces of each set of arches.” Defective splicing was found in the lower chords, and oak blocks were ordered to be put in place to prevent movement. Some bad pieces of floor planking had to be replaced. The lower horizontal braces had to be replaced with new timber and secured according to the original plans. After the bridge was completed in July of 1857 over 2000 boats a year used the bridge during the canal’s busiest years. Tolls for the bridge were as follows; 1 cent for a person and 5 cents for a horse, or a yearly charge of 25 cents a person or $2.50 to $6.00 for a farmer. While there was a very handsome stone house next to the bridge for the toll collector to live in, during the hot summer months the toll collector slept on the bridge. There was a fold down bed on the bridge in which the toll collector slept. Under the bed was a wooden box in which his watchdog lived. Next to the bed there was a small planing or workbench on which small repairs could be made on the bridge. Next to the workbench was a gaslight and a cabinet containing carpenter tools. The toll collector received $30.00 a month plus the use of the tollhouse (or a bed on the bridge in the summer if so desired). Tolls continued to be charged until June 9,1890, at which time the court declared the bridge to be free of tolls. As a side note, on June 10, 1909 the 40-foot wooden approach span constituting the Muhlenberg approach to Stoudt’s Ferry Covered Bridge collapsed. Cyrus and George Roth, brothers, narrowly escaped with their lives. The two men were hauling a load of manure across the structure when it broke down. The four horses hitched to the wagon, the vehicle, and the men were precipitated to the roadbed leading to Charles Durell’s farm, 20 feet below. The approach bridge was rebuilt shortly thereafter. After the canal ceased operating, the bridge lost half of its usefulness and was neglected. Holes in the roof were not repaired and rain rotted some of the supporting beams of the bridge. By March of 1945, the bridge was in such bad shape that a bill was introduced in the State Capitol, which would turn possession of the bridge over from the County to the State. It was intended that the State Highway Department would then repair Stoudt’s Ferry Bridge, the longest single-span wooden covered bridge in the world. Stoudt’s Ferry Bridge was to become a historic and engineering landmark. But the lawmakers could not agree and did not act fast enough. On Saturday, September 11,1948 the county commissioners closed the bridge to traffic after local residents complained of hearing creaking noises coming from the bridge. The Bern Township side of the bridge had fallen two feet. On Sunday, September 12, 1948 Stoudt’s Ferry Bridge collapsed into the river, never to become the national landmark it had deserved to be. 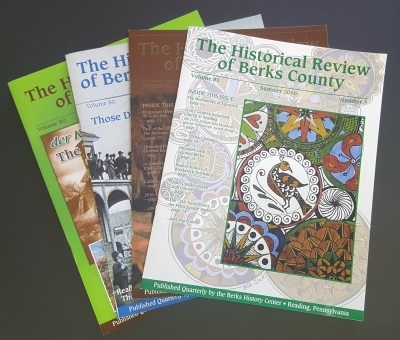 This article originally appeared in the Fall 2003 issue of the Historical Review of Berks County.